What about this plasma physics? Will it ever amount to anything? While the Hydrodynamics Division sank at Langley, a few new research fields bobbed to the surface to become potent forces in the intellectual life of the laboratory. Most notable of these was magnetoplasmadynamics (MPD)-a genuine product of the space age and an esoteric field of scientific research for an engineering-and applications-oriented place like Langley. If any "mad scientists" were working at Langley in the 1960s, they were the plasma physicists, nuclear fusion enthusiasts, and space-phenomena researchers found in the intense and, for a while, rather glamourous little group investigating MPD. No group of researchers in NASA moved farther away from classical aerodynamics or from the NACA's traditional focus on the problems of airplanes winging their way through the clouds than those involved with MPD. The field of MPD concerned the effects of magnetic and electric fields on the motions of plasmas. A plasma, as simply defined at the time, consists of an ionized high-temperature gas. For those readers who have forgotten their high school chemistry, a gas consists of atoms and molecules that are virtually unrestricted by intermolecular forces, thus allowing the molecules to occupy any space within an enclosure. In other words, the atoms and  molecules are continually moving around and colliding with one another. When a sufficiently violent collision between two atoms occurs, a negatively charged subatomic particle known as an electron is knocked out of its orbit, thus resulting in a "free electron" (an electron that is not bound to an atom). Sometimes in the collision, an ion (a positively charged particle bound to the electron) is knocked free as well. At the instant these particles are released, the gas is said to be "ionized" and is called a plasma. But the name did not prevail at NACA Langley. There, in the years before the establishment of NASA, a coterie of aerodynamic researchers involved in plasma studies conducted in the center's Gas Dynamics Laboratory, thought that the name magnetohydrodynamics was not appropriate. The interested researchers were not concerned with water but rather with hot gases or plasmas, so they coined the term "magnetoplasmadynamics." Outside of NASA, however, magnetohydrodynamics remained the standard term. Thus, in large measure, the interest in MHD began with the modern astrophysicists. From the 1920s on, many of their most essential questions concerned MHD: What mechanisms are involved in galaxy formation? What is the nature of the magnetic fields of the sun and the other stars? How does the internal energy in hot stars convert into the kinetic energy of gaseous clouds in interstellar space? How do stars form from gas clouds? What is the origin of cosmic rays, the Solar System, the universe? The key to understanding the cosmos lay in the fathoming of MHD principles. Another important discovery of the space age fed the new science of magnetospheric physics: the notion of "the solar wind." This theory was first expressed by Eugene N. Parker of the University of Chicago in 1958 and later confirmed by measurements taken from Soviet Lunik spacecraft in 1959-1960 and from Explorer 10 in 1961. Parker suggested that the sun's corona, or outer visible envelope, was expanding continuously, causing streams of ionized gases to flow radially outward from the sun through interplanetary space. (The sun is, after all, a big ball of plasma.) The intensity of these plasma streams varied greatly relative to solar activity, especially solar flares. The force of these streams, or solar wind, impinging upon the earth's magnetic field created the familiar magnetic storms.7 By 1960 scientists possessed evidence that a plasma wind did blow continuously from the sun, and the wind clearly displayed dynamic magnetic phenomena. The field of study that the Langley researchers had come to call MPD was growing quickly in esteem and importance, not only in the United States but also around the world. Newly conceived experiments with magnetically compressed plasmas provided scientists with an opportunity to generate and study a small sample of the solar corona in the laboratory. Scientists gathered basic data on subatomic behavior at temperatures for which no such information existed before. A major and extraordinarily exciting new age of modern physics was dawning. Scientists saw fascinating new research opportunities, and they dreamed of fantastic technological applications. Unfortunately, very few of their dreams would be realized. But in the early 1960s, that was something impossible to know. What Langley researchers, especially those involved in gas dynamics and other hypersonic investigations, did know in the late 1950s was that the time for a major change had arrived. "The space age told us to move away [from] classical aerodynamics into more modern things," remembers Macon C. "Mike" Ellis, the man who would head Langley's formal MPD effort, "and, as quickly as we could, we did. "8 in handwritten notes made at an internal meeting of his Gas Dynamics Branch held on 18 June 1958- during the same period that plans for NASA's initial organization were being formulated in Washington-Ellis wrote, "Either we make a big change now or [we] try to make more significant contributions in aerodynamics." Now was the time for Langley researchers to assume leadership roles in the emerging space disciplines and vigorously seek major technological applications. Through the late 1950s, nothing had been done formally at Langley to focus the efforts of those involved in the study of MPD-related subjects. Many people at the laboratory, some of them senior engineers and research managers, did not know what MPD was or did not understand what all the fuss was about. Furthermore, nearly all of the people concerned with MPD were members of the Gas Dynamics Laboratory, so they were already grouped together and interacting regularly. Thus, for several months, even after the new space agency was established, no Langley leaders saw a need to create a new organization just for the MPD enthusiasts. But interest in the new field kept growing. The idea that flows could get so hot that the constituents of the air would actually break down and become treatable by applying magnetic forces was extremely exciting. If airflows could be "treated" electromagnetically, they might even be controlled. That was every aerodynamicist's dream. MPD offered a sort of aerodynamic alchemy, a magical way of turning lead into gold, rough turbulent flow into smooth laminar flow, dangerous reentry conditions into pacific ones. With these glorious possibilities, MPD fostered great technological enthusiasm and attracted many able researchers who hoped to find solutions to some fascinating and very complex problems. Above all other members of Langley's staff, Floyd Thompson, still officially the associate director, became most enthralled with the glamour of MPD. As Mike Ellis remembers, "Thompson was tremendously supportive of our effort." One of the best measures of Thompson's enthusiasm was his request that the MPD staff be "on tap" as the special attraction for major events. He "always put us on stage at the NASA inspections and when various groups of scientists came through the laboratory," Ellis  recalls. 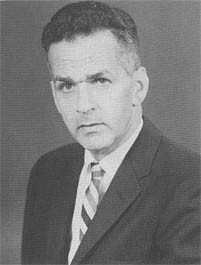 Thompson appreciated that work in this exciting new field of science could enhance the reputation of his aeronautics laboratory.12 In May 1960 the same month he took over officially from Henry Reid as the Langley director, Thompson established a Magnetoplasmadynamics Branch of the Aerophysics Division. From its beginning, MPD was one of Thompson's pet projects. The Aero-Physics Division was the natural home for Langley's MPD effort. 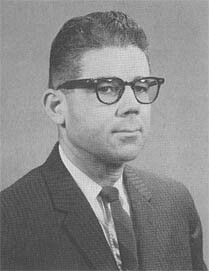 This division was led by hypersonics specialist John V. Becker, an NACA veteran whose employment at Langley dated back to 1936 and who by the mid-195Os had become deeply involved in work related to hypersonic gliders and winged reentry vehicles. 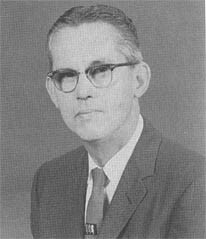 A research-minded engineer, Becker was a strong and confident division chief (he had been one since the mid-1940s, passing up several opportunities to move up to posts in senior management). He was comfortable having a research effort as esoteric and as sophisticated as MPD based in his division. Scientifically, he was quite sharp and was more than capable of appreciating the complexities of this new field of research as well as its promise for making major contributions to the space program. Through the 10-year span of the MPD Branch (1960-1970), Becker not only tolerated the many MPD enthusiasts in his division but also almost always supported their ideas. The first and only person to be in charge of Langley's MPD Branch was Mike Ellis, an NACA veteran who was 42 years old when the branch was organized. Ellis had come to work at Langley in 1939, and over the course of his career at the laboratory, he had been involved in pioneering work on the aerodynamics of jet engines, ramjets, and supersonic inlets and nozzles. Fittingly, Ellis had worked for Eastman Jacobs and with Arthur Kantrowitz in the early 1940s, and he had heard firsthand accounts of his former colleagues' attempt to design a fusion reactor in the spring of 1938. By the late 1950s, Ellis was one of Langley's most outspoken believers in MPD's promise of technological benefits. 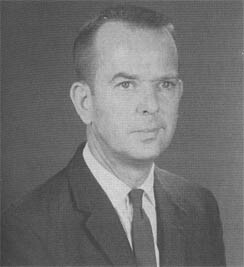 Ellis encouraged Floyd Thompson's enthusiasm for MPD and persuaded Langley's senior staff of mostly engineers that MPD was a field of research vital to the future of NASA. When the time came to pick someone to head the new branch, Ellis was unquestionably the person for the job. The MPD Branch never became a large outfit. By the end of 1962, it had less than 50 total staff members: 27 professionals, 10 mechanics, 4 computers (mathematicians who helped to process and plot numerical data), and 6 secretaries. This staff was divided into four teams or sections. Plasma Applications, headed by Paul W. Huber, was the largest section, with 8 professionals. 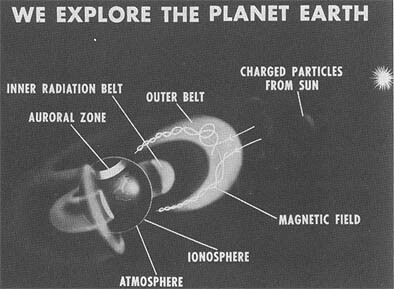 Space Physics, led by British physicist David Adamson, was the smallest with 3. Robert Hess's Plasma Physics Section had 7 professionals, and George P. Wood's Magnetohydrodynamics Section had 5. These sections (and their section heads) remained in place until the dissolution of the MPD Branch in 1970. In addition to being small, MPD was self-contained. Whereas most of the research done in the center's branches regularly spilled over into other functioning units, most MPD work was done within the MPD Branch. A small amount of related research was done in the Flight Research Division and Full-Scale Research Division; however, most of this work concerned the development of microwave and spectroscopic diagnostic techniques. All told, the MPD work conducted outside the MPD Branch never involved more than about five researchers. Among the scientists working in MPD at Langley were several Germans. Like many other scientific institutions around the country, Langley had received a handful of German scientists who were part of Operation Paperclip, the U.S. Army intelligence operation that brought captured German rocket scientists and engineers to work for the U.S. government at the end of World War II. Busemann and two other outstanding researchers, Karlheinz Thom and Goetz K. H. Oertel, came to Langley through Paperclip. Both Thom and Oertel moved from Gas Dynamics to George Wood's MHD Section of the new MPD Branch. Both men stayed at Langley for several years before eventually taking posts at NASA headquarters. Paul W. Huber (left), head of MPD's largest section, Plasma Applications. In the mid-1960s, French nuclear scientist Dr. Marc Feix (right) floated from section to section within the MPD Branch, helping researchers solve theoretical problems basic to plasma physics. But the prestige could last only if Langley's MPD work proved deserving; the proof lay in conducting outstanding research programs and producing meaningful results. When the MPD Branch was formed in 1960, Langley researchers saw three particularly promising applications for MPD research. First, they hoped to accelerate gases to very high speeds to study and solve the reentry problems of intercontinental ballistic missiles (ICBMs), spacecraft, and transatmospheric or aerospace vehicles such as the North American X-15 rocket plane and the U.S. Air Force proposed X-20 DynaSoar boost-glider. The potential for these applications explains in part Langley's commitment to the small-scale but significant program of research and development of various plasma accelerators. 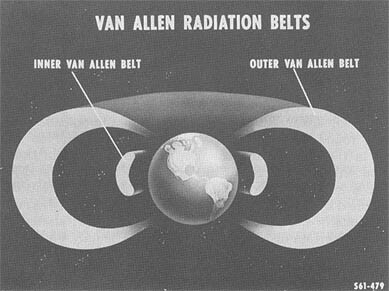 Concern for the problems that the ICBM encountered during reentry flight prompted Langley researchers to begin the study of MPD in 1958 The physics of the unique conditions of the hot ionized flow around the missile's nose during reentry demanded special attention. Space vehicles  when reentering the atmosphere quickly became covered with electrically charged particles These particles formed a "plasma sheath" behind the bow shock Researchers hoped that an application of electric and/or magnetic fields to the plasma sheath could affect the airflow in desirable ways; for example' it could reduce the heat transfer to the nose. The most direct effect of the plasma sheath, however, was that radio transmission from the vehicle during reentry was not possible for obtainable radio frequencies. The plasma caused a period of "radio blackout." To solve these problems, researchers at Langley had to simulate reentry conditions in the laboratory. This would require some new and unusual research equipment; conventional wind tunnels would not do the job. Small hypersonic tunnels, made possible by the development of high-temperature heat exchangers and high-speed nozzles and operated on an intermittent basis for flow durations of only seconds to no more than a minute, permitted studies of some forces during reentry, but not all and not some of the most important. 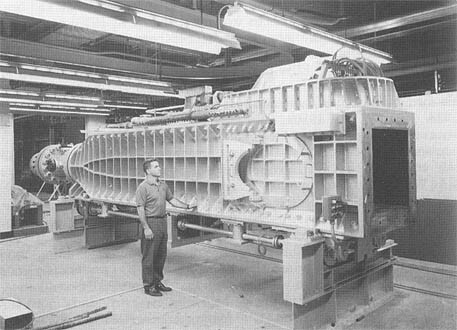 Fundamentally, the arcjet was just another hot-gas wind tunnel, which heated the gas electrically (typically using 100,000 kilowatts) to high temperatures in a low-velocity settling chamber, and then expanded it quickly through a tiny nozzle to supersonic velocities. No translational electric or magnetic forces acted on the gas in this conventional arcjet. The gas was simply being heated by an electrical discharge. Most of the charged particles in this high-temperature discharge recombined in the cooling process that occurred during expansion. Research physicist Philip Brockman pushes the button to start the MPD-arc plasma accelerator in December 1964. 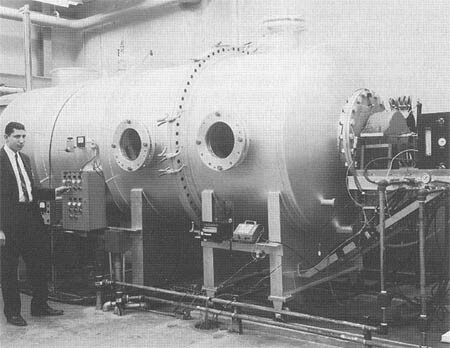 The test chamber for this facility was part of a larger high-flow, low-vacuum space simulation apparatus housed within the MPD Branch. L-64-11,179. ...that then made its way through the test section was a mixture of hot air and vaporized copper, a very unsatisfactory medium for aerodynamic testing. The facility remained active into the 1970s, but the amount of useful work accomplished in it was quite limited. Langley's first shock tube began operation in the Gas Dynamics Laboratory in late 1951. By the end of the NACA period, three more shock tubes were put to work at the laboratory; they produced temperatures between 10,500° and 15,000°F, attained speeds of Mach 8 to Mach 20, and had  running times of 0.001 to 0.002 seconds.25 Researchers believed that experiments with these devices would yield much knowledge, even though everyone involved with shock-tube work conceded that "it was a very tough area of research." Contending with flows that lasted for only a few thousandths of a second and that required a considerable amount of special instrumentation was "a fantastic problem." How were researchers "to get answers out of something like that?" 26 Still, those passionate about high-velocity flows and high-temperature gases at Langley put great faith in the shock tube. The facility was used for much basic research including studies of shock waves generated by atomic bomb blasts. George P. Wood (right), head of MPD's Magnetohydrodynamics Section, developed Langley's earliest crossed-field plasma accelerator. The accelerator section of the 20-megawatt plasma accelerator facility is shown below. Note the many electrodes for furnishing the high-energy electric field. In this April 1963 photo, MPD lab technician Charlie Diggs regulates the flow of a test gas in an early 10-kilowatt test version of Langley's Hall-current plasma accelerator (above); over his left shoulder sits a Polaroid camera for photographing an oscilloscope. 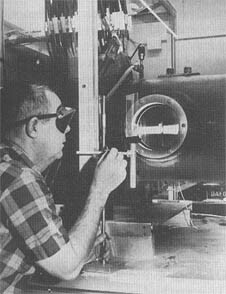 In November 1965, an unidentified technician (left) wears goggles to protect his eyes against the intense light in a later coaxial version of a Hall-current plasma accelerator. In the test section, one can see the very bright, high-velocity plume from the MPD arcjet exhausting into a vacuum tank. ...Nixon administration forced an abrupt halt to the accelerator's pioneering work. Whether the machine would have ever completely panned out, no one can be sure. In NASA's report on the last tests made in this device, published in 1971, George Wood and his colleagues pointed out that an exit velocity of 30,176 feet per second had been achieved, which was a remarkable 81 percent of the facility's computed capacity of 37,064 feet per second. According to the NASA report, the crossed-field accelerator "appears to be the largest and highest velocity nonpulsed linear plasma accelerator" to attain "an operable status. "30 An experimental facility with this record must be called a success. While trying to work out the kinks in Wood's crossed-field accelerator design, Langley's MPD experts conceived several other methods for accelerating plasmas. One of these methods, which was not pursued very far, they called "microwave cavity resonance." The major alternative, however, was known as the "linear Hall-current accelerator." This type of plasma accelerator was based on a principle of electrical polarization and current generation laid out by the American physicist Edwin H. Hall in the 1920s and 1930s. The facility used a constant rather than intermittent interaction of currents and magnetic fields across a channel to accelerate a steady flow of plasma. In the late 1950s, the Langley MPD group found a stopgap method of generating a plasma in the laboratory. This method involved the production of a hot flame fueled by the combustion of cyanogen gas and oxygen. MPD physicist Bob Hess was an intense researcher and bibliophile. He combed the current technical and scientific literature for ideas that might prove useful to his and his colleagues' work. Proficient in German and French as well as English, he was able to keep abreast of scientific ideas along several fronts. With his desk piled high with papers, Hess ferreted out the best notions, and massaged them for his own creative uses. **** In 1957, Hess came across a reference to a new experimental device at the Research Institute of Temple University in Philadelphia. This device produced an extremely hot flame by burning oxygen with cyanogen, a colorless, flammable, and poisonous gas, sometimes formed by heating mercuric cyanide. After reading about the cyanogen flame experiment, Hess hit on an idea for adapting the flame to create a hot plasma for simulating the space reentry environment. By feeding oxygen and cyanogen gas into a combustion chamber and igniting the mix, the researchers at Temple were producing a flame of more than 8000°F This was one of the hottest flames scientists had ever produced. What would be the result, Hess mused, if a potassium vapor that ionized easily at that temperature was added to the combustion chamber? Would  this create a jet of hot gas that reproduced the extremely ionized plasma conditions of missile reentry? At Langley, Paul Huber with the help of the facilities engineering group quickly designed a cyanogen flame apparatus, and the funding for its construction was approved. By the time the NACA became NASA, the device had been operating for several months. As expected, the first major test program conducted in Langley's alkali-metal-seeded, cyanogen-oxygen flame explored how flow-field conditions near an ICBM nose prevented the transmission of radio signals back to earth. Researchers in the Gas Dynamics Laboratory working with Joseph Burlock of IRD mounted a transmitting antenna in front of a nozzle that bathed the antenna in the hot cyanogen gas jet. Instruments then measured the rate at which the transmitter lost its signal power. The MPD program was particularly valuable to the little known NASA project RAM. Initiated too late to help in the communications blackout problems of the Mercury and Gemini capsules, the purpose of Project RAM was to support the Apollo program. Many of the project's results proved inconclusive, and most of the hoped-for technological fixes, for example, the use of higher radio frequencies and the timed injection of small sprays of water into the hot gas envelope surrounding a reentering spacecraft, were judged too problematic for use in Apollo. However, MPD specialists at Langley did learn how to predict the flow-field characteristics of a reentering spacecraft more accurately, and their work led to viable schemes for alleviating or "quenching" part of the plasma sheath so that some level of effective radio communications to and from a reentering vehicle could occur.34 Experience gained in the MPD reentry experiments of the 1960s eventually aided in projecting the reentry conditions of the Space Shuttle. Not all of Langley's MPD work sought such direct technological applications as Project RAM. Some of the more fruitful research efforts fell into the realm of basic science and represented what MPD Branch Head Ellis de scribed in a February 1962 briefing to the Langley senior staff as "examples of keeping research alive on a reasonable scale without solid, specific applications or even the guarantee of applications! "35 One such effort that made significant contributions was a barium cloud experiment designed for exploration of the interaction between the solar wind and the earth's magnetic fields. At Langley, these cosmological matters were of particular interest to the small group of theoretically inclined researchers working in the MPD Space Physics Section under David Adamson. Beginning in late 1963, the Adamson group began to seriously consider a novel experimental technique by which scientists could use an artificially ionized plasma "cloud" as a space probe. As Adamson explained at the time, the principle of the cloud was rather simple. Only three requirements were placed on the cloud: it had to be fully ionized, the ionized atoms had to show resonance lines in the visible portion of the spectrum, and it had to be visible to observers on earth. The notion of an ionized cloud was not new. For several years, research groups around the world had been experimenting with chemical releases as a means of exploring the nature of the upper atmosphere. For the most part, the creation of such artificial clouds was done by launching a sounding rocket carrying on its nose a payload of pyrotechnic constituents mixed with alkali metals. At the proper altitude in the upper atmosphere, a canister carrying the payload would be ejected. The temperature of the canister's contents would rise thousands of degrees and then escape explosively to form a colorful vapor whose atoms would glow blue violet in the sunlight. The result was a bright and rather beautiful space cloud, a sort of instant aurora, which could be seen quite distinctly by an observer watching from the nightside of the earth. Highly responsive magnetometers and spectroscopes could then be used to analyze the physics of what happened when a body of charged particles exploded in the outermost realms of the earth's atmosphere and at the fringes of space. The world leaders in developing the tricky optical cloud technique were the West Germans, specifically a group of experimental astrophysicists in the Gaerching Laboratory of the Max Planck Institut in Berlin. The leading figures in the development of what came to be known as "the barium bomb" were Dr. Ludwig Biermann and his associate Dr. Riemar Lust. In 1951, Biermann had anticipated Parker's discovery of the solar wind by hypothesizing that a comet's tail, which always points away from the sun, was being pushed by streams of solar particles. He spent the rest of the decade looking for an experimental means by which to prove his theory. 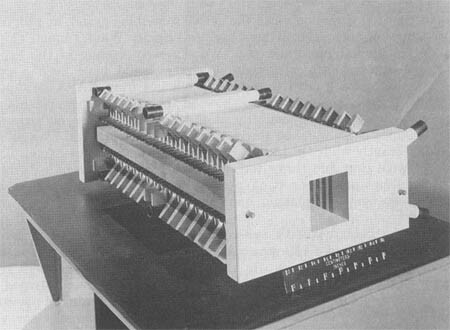 By the late 1950s, the Biermann group had developed a technique for the creation of an artificially ionized cloud in the upper atmosphere. By 1964, although the existence of the solar wind was by then taken for granted, the same group was ready to use more powerful rockets to deploy the first of these clouds in space. 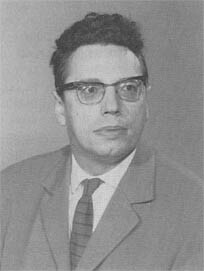 In the summer of 1964, Bob Hess traveled to Feldafing, near Munich, Germany, to participate in an international symposium on the diffusion of plasma across a magnetic field. At this meeting, Hess spoke with Biermann about the barium cloud technique. The interest of the West Germans in the experiment was different from that of Langley's MPD Branch. The Germans wanted to release barium in the streaming solar wind outside the magnetosphere in the hope of learning more about the formation of comets; the NASA researchers sought to explore the magnetosphere itself. Nevertheless, the interests were similar enough to make Biermann and Hess agree that some measure of international cooperation would be useful. The space scientists at NASA headquarters were interested in the general idea, but plans to proceed progressed slowly through 1965 and 1966. Other space science experiments more directly supportive of the Apollo lunar landing program, like the Surveyor and Lunar Orbiter programs, received the highest priority. Still, the MPD Branch in conjunction with the appropriate program officers at NASA headquarters, as well as with the technical support of the Applied Materials and Physics Division at Langley, continued to plan for the cloud experiment. From Wallops Island, NASA would launch an explosive canister atop a high-altitude rocket. ****** Early on,  Langley researchers thought that the canister should contain a combustible mixture of cyanogen-oxygen with cesium; however, with input from Lust's team in Germany, they finally chose a barium payload. At the appropriate altitude in space (the rocket would not go into orbit), the canister would detonate and out would float the ionized particles which would form the space cloud. The cloud would last several minutes to more than one hour during which it would reflect radio waves and could be viewed from a location on earth in the sun's shadow. 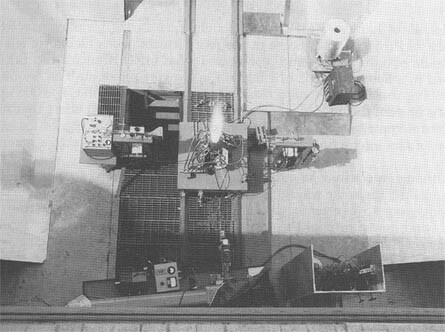 Four months later, on 24 September 1966, in a joint effort with the Max Planck Institut, NASA launched a four-stage Javelin sounding rocket from Wallops Island to check its canister-ejection technique, and on the next day, again from Wallops, launched a Nike Tomahawk rocket which released a mixture of barium and copper oxide. The second "shot" only reached 160 miles, whereas the desirable altitude for a barium cloud release was 3 to 5 earth radii. Nonetheless, the experiment was successful. For hundreds of miles up and down the Atlantic coast, three distinct clouds were visible. NASA and West German scientists photographed the clouds in an effort to track and measure electric fields and wind motions in the upper atmosphere. The results of both launches caused quite a public stir. Some residents along the coast reported sightings of brilliant UFOs, and some motorists became so fascinated by the brightly colored clouds that they ran off the road. Despite a fatal explosion on 5 October 1967, at the Downey, California, plant of North American Rockwell, which was caused by a mishandling of finely divided barium mixed with Freon, the barium cloud experiment eventually proved a great success.44 On 17 March 1969, a barium cloud 1865 miles long, lasting some 20 minutes, and visible to the naked eye, formed at an altitude of 43,495.9 miles (69,999.87 kilometers). 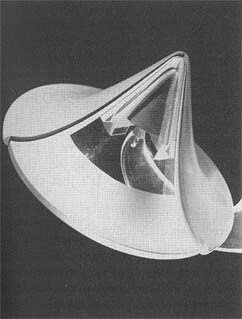 Heos I a "Highly Eccentric Orbiting Satellite" belonging to ESRO, carried the cloud-producing canister into space. Instrumented observation of this and subsequent plasma cloud-in-space experiments revealed the motions of the earth's magnetic field lines, including those influencing the aurorae; demonstrated other plasma effects in space; helped scientists to correlate these motions and effects as a function of solar flares; and generally allowed world astrophysicists to model the geomagnetosphere more accurately. All the barium cloud shots generated considerable public concern and interest and were widely announced in advance in the press. Aside from fascinating the public, this experimental probing of the near-earth environment of space also led researchers to explore what was believed to be the great potential value of magnetospheric data for understanding and perhaps even controlling the earth's weather. Although the energies in space were recognized to be small compared with those in the atmosphere, those researchers interpreting the results of the barium cloud experiment raised the possibility that even small disturbances of inherently unstable regions in space could trigger significant behavior in large regions around the earth. Astrophysics was not the only driving force behind the explosion of MPD research in the 1950s. Another inciting factor was the quest for atomic energy. After World War II and the dawn of the atomic age, many physicists had begun exploring ways to confine plasmas magnetically in a new sort of nuclear reactor based not on fission but on fusion. Such projects were designed to explore the potential of generating thermonuclear power. Many researchers and institutions believed this was the pot of gold at the end of the MPD rainbow. Many of the devices developed during Project Sherwood served as advanced research tools. Although highly varied in their designs, almost all the facilities tried, with only partial success, to produce fusion reactions through some type of magnetic containment of a plasma. By the 1950s, scientists knew that a thermonuclear reactor would require a reacting gas with a temperature of at least 1,000,000,000 kelvin (K). Because containment of such an extraordinarily hot gas by solid walls seemed impossible, many plasma physicists believed that the only way to contain the gas was by powerful magnetic forces. Further work in MPD became vital. At Langley, as elsewhere, researchers turned to the sun (a giant fusion reactor) to find the answers. In Langley laboratories, the MPD group worked on designing facilities that would simulate the activity of the solar corona. 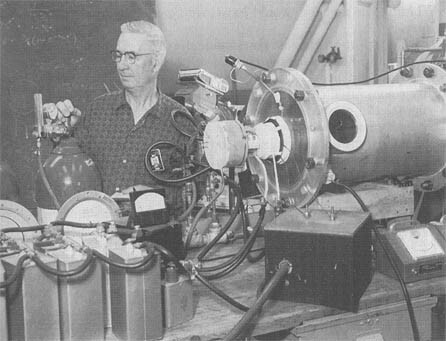 George Wood's MHD Section built several highly experimental devices to study solar physics; however, none of them yielded the secret of thermonuclear power. Consider, for example, George Wood's first highly experimental facility for the basic study of solar-coronal physics, the one megajoule theta-pinch. "The pinch" used a powerful, one-million joule******* discharge of direct-current (DC) electricity along a single-turn coil to generate a strong longitudinal magnetic field. Wood's section hoped that an interaction of this high-density current with its own magnetic field would cause a contained column of plasma (that is, a molten conductor) to self-contract and become pinched even tighter and perhaps even to rupture itself momentarily, thus producing a controlled fusion reaction. A third important fusion research effort of the MHD Section involved the plasma-focus research facility. Although the stated purpose of this facility (whose operation dates to the mid-1960s) was to simulate and study the physics of solar flares, its real purpose from the outset was to explore  the possibilities of fusion. ******** Essentially, the plasma-focus apparatus was a coaxial arrangement wherein a sheet of electrical current was created by a high-energy discharge from a powerful capacitor bank. The current sheet traveled down a ring-shaped (annular) channel designed around a central anode (positive electrode) and collapsed by virtue of its own self-induced magnetic field into a high-density plasma. These achievements signified that Langley's general fusion-related re search rated near the top of the American scientific effort by the early 1980s. Langley's work was equal to similar pioneering efforts by Winston H. Bostick at the Stevens Institute of Technology in New Jersey and G. R. Mather at Los Alamos National Laboratory in New Mexico. Of course, the chronology for this work extends beyond the period that is the focus of this book; however, the relevance of the research carried on by the MPD Branch of the 1960s extended to these significant follow-on efforts. Ten years had passed, and the ambitions of the first exhilarating moments of the spaceflight revolution had been moderated by the mounting frustrations of trying to achieve significant research results in what was proving to be a much more illusive area of research than anticipated. "The field was just so incredibly complicated," Mike Ellis remembers, "that to make a really significant contribution that would apply to some great problem just became increasingly hard." 52 The deeper the Langley researchers and others plunged into the MPD field, the more they realized how difficult contributing to any applications would be. In other words, much of what MPD researchers had been trying to do just proved unnecessary. Never before in the history of applied basic research at Langley had a field of study promised so much, yet delivered so little. But the "mad scientists" of MPD were not mad in their pursuit; they were just different from the "normal" body of researchers at Langley, who searched for practical solutions and did not stray into matters of fundamental cosmological importance. The MPD group's commitment to basic scientific research was in fact quite sensible. At a time when NASA had an increasingly strong political mandate for research that was "relevant" to the technological objectives of space projects, the "mad scientists" of MPD maintained a broader and more fundamental interpretation of relevant research. * Preference for one name over the others depended on whether the scientists involved felt that the electrically active medium that they were studying should properly be regarded as a continuum or, more accurately, as comprising discrete individual particles. The astrophysicists preferred the name "hydromagnetics"; the aerodynamicists opted for "magneto aerodynamics. " *** Ironically, neither Wood, head of the MHD Section, nor Hess, head of the Plasma Physics Section, held a Ph.D. Wood completed all the course work toward a doctorate in the early 1930s, but because of the Great Depression he had to go to work before receiving his degree; Hess graduated from the Vienna Institute of Technology and had taken graduate courses in fluid mechanics and thermodynamics at MIT in the late 1930s, but he also did not possess an advanced degree. **** For example, in 1945 Hess found an overlooked British translation of German aerodynamicist Dr. Adolf Busemann's seminal 1937 paper on sweptwing theory. Hess found it in the Langley Technical Library, where his future wife, Jane, would someday serve as the head librarian and assist him greatly with his search for references, and he passed it on to colleague Robert T. Jones. This was just prior to Jones's final revision of a confidential NACA paper in which Jones would report his independent discovery of the advantages of wing sweep for supersonic flight. ***** An astronomicaI unit is usually defined as the mean distance between the center of the earth and the center of the sun, i.e., the semimajor axis of the earth's orbit, which is equal to approximately 92.9 X 1,000,000 miles or 499.01 light seconds. ****** The type of rocket was yet to be determined. Ultimately, several sounding rockets, as well as Langley's multipurpose Scout rocket, would be used. ******* A joule is equivalent to one watt-second. ******** A much earlier piece of equipment for plasma research at Langley known as "the diffusion inhibitor" was developed to pursue thermonuclear power. In 1938, Langley researchers Eastman N. Jacobs and Arthur Kantrowitz tried to confine a hot plasma magnetically and thereby achieve a controlled thermonuclear reaction. Although NACA management quickly stopped the unauthorized research, the preliminary experiments attempted by Jacobs and Kantrowitz in their toroidal (or doughnut shaped) chamber represent not only Langley's first flirtation with the basic science later leading to MPD studies but also the first serious effort anywhere in the world (and three years before the Manhattan Project) to obtain energy from the atom. For a complete account of the Jacobs Kantrowitz fusion experiment of 1938, see James R. Hansen, "Secretly Going Nuclear," in American Heritage of Invention & Technology (Spring 1992) 7:60 63. 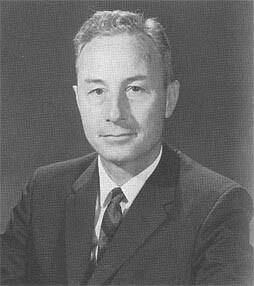 ********* Ellis himself, however, did not move into the new Space Sciences Division; instead, he became one of the assistant chiefs (and later associate chief) of John Becker's Aero Physics Division. Paul Huber, head of the Plasma Applications Section, became head of Aero-Physic's Propulsion Research Branch, which worked on hypersonic scramjets.